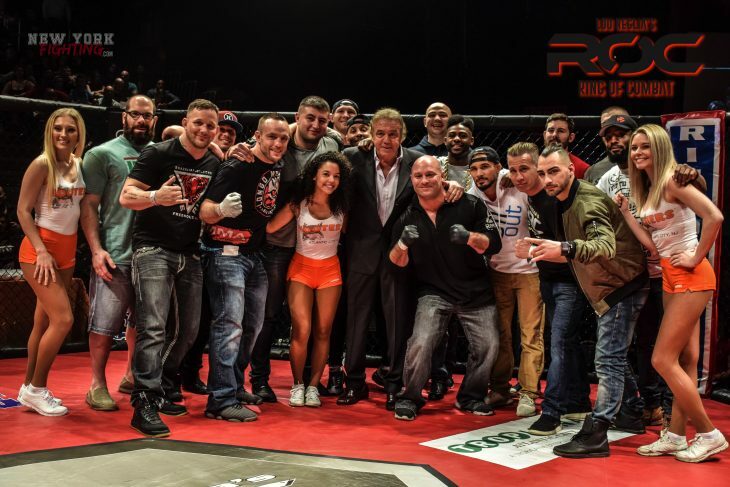 Ring of Combat 58 Recap | Lou Neglia's Ring of Combat | Next Generation of Mixed Martial Arts! A sold-out crowd witnessed a tremendous night of action at the Tropicana Showroom in Atlantic City, New Jersey for Ring of Combat 58. The crowd was so energetic at times, it was hard to hear the timekeeper at the end of rounds...and for good reason. The 11 bout card had fans at the edge of their seats with the back and forth action. Fight fans let it be known, when you go to a ROC show, you’ll get your monies worth. The main event was a featherweight rematch between east coast phenom and Tiger Schulmann's protege, Julio Arce (11-2) against the former champion and highly touted, Frank Buenafuente (7-4). The first round saw Buenafuente drive Arce to the cage for a takedown attempt. While he was able to drag his opponent to the ground briefly, Arce was never really in trouble as he kept cool under fire. After working his way back up, it was all Arce. The second round saw Arce go on the attack and take Buenafuente’s back where he locked in a vicious body triangle while constantly threatening with a rear naked choke. The highly touted Buenafuente fought hard to break the grips of his opponent but ultimately succumbed to submission midway in the second. Julio Arce improves to 11-2 while making his first title defense of the National ROC Featherweight title. The co-main event saw Pennsylvania’s Sidney Outlaw (7-2) win the vacant National ROC Welterweight title over a game Tajuddin Hakim-Abdul (4-1). Outlaw used his excellent wrestling to take down Abdul at will. It was hard night for Abdul as he wanted to stand and trade but could not keep Outlaw from taking him down. Outlaw coasted to a unanimous decision picking up ROC gold! Merab Dvalishvili (6-3) of the famous Serra-Longo fight team picked up the vacant National ROC Bantamweight title with a very impressive win over Brooklyns MMA’s, Sukhrob Aydarbekov (2-3). Sukhrob landed the kind of combinations of head kicks and punches that would KO most opponents but Merab was fighting as a man possessed and was not going to be denied this night as he eventually caught Sukhrob in a tight armbar forcing the tap in the second round. With their title winning performances Julio Arce, Sidney Outlaw and Merab Dvalishvili officially put Dana White and the UFC brass on notice! Hosch wins unanimous decision in three rounds 29-28, 29-28 , 30-27. ‎Sabatini wins via tap due to rear naked choke at 2:49 of round two. ‎Gonzalez wins via tap due to triangle at 3:12 of round two. Caracappa wins unanimous decision in three rounds, all three judges 30-27. ‎Mickle wins majority decision in three rounds 29-28, 29-28 and 28-28. ‎Sneed wins unanimous decision in three rounds, all three judges 29-28.